It was a busy day for solar cooking yesterday. My husband needed a squash, I needed to reheat some frozen lentil joes for dinner, and the kids wanted baked chips for lunch. I had it all planned out so that we could get everything into the oven and cooked in time…then it turned cloudy and spoiled my plans. The squash got finished, I managed most of the chips, but dinner ultimately was reheated in the microwave. 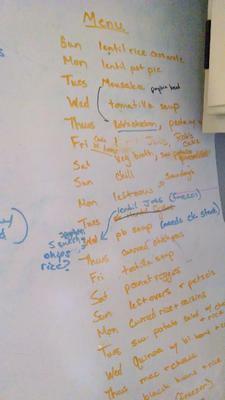 Which brings me to my point: solar cooking requires some planning. Before I finish breakfast most days, I have to know what we are eating and in what order it needs to be cooked. This isn’t a big deal for us, but I thought I’d share my system in case anyone else wants to know. In the kitchen we have a giant marker board. On it is posted the menu for about 2 weeks. This let’s me plan how to most efficiently use our food and tells me what to shop for at the grocery store. Then, I check it the night before and plan out what order to solar cook in the next day. It may not work for everyone, but it works for us. Maybe someday we’ll have another oven and can cook more at once! Does anyone else have a good system for this that they would like to share?